Donald Trump gave this post-Summit Interview with George Stephanopoulos on Tuesday 12 June 2018. What follows is a partial nonverbal analysis focusing on some specific body language deviations which the President displayed. A few hours earlier, Trump and Kim had signed a document - officially titled: "Joint Statement of President Donald J. Trump of the United States of America and Chairman Kim Jong Un of the Democratic People's Republic of Korea at the Singapore Summit". 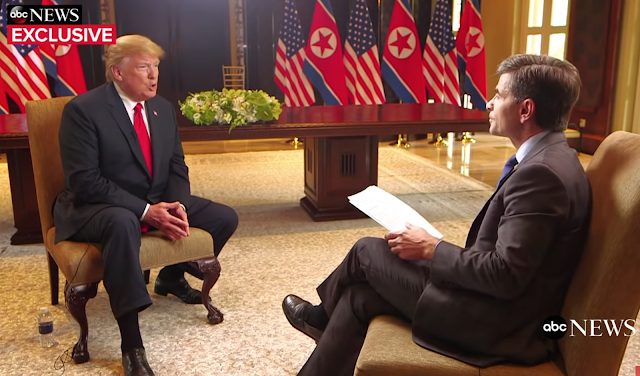 The signing took place in this same room - and Trump and Kim sat at the table which, in this interview, is positioned behind and to the left of Trump. Look at this screen grab of Donald Trump. His hands are configured in what is known as a Low Steeple (more specifically: a Seated, Low, Conventional Steeple). 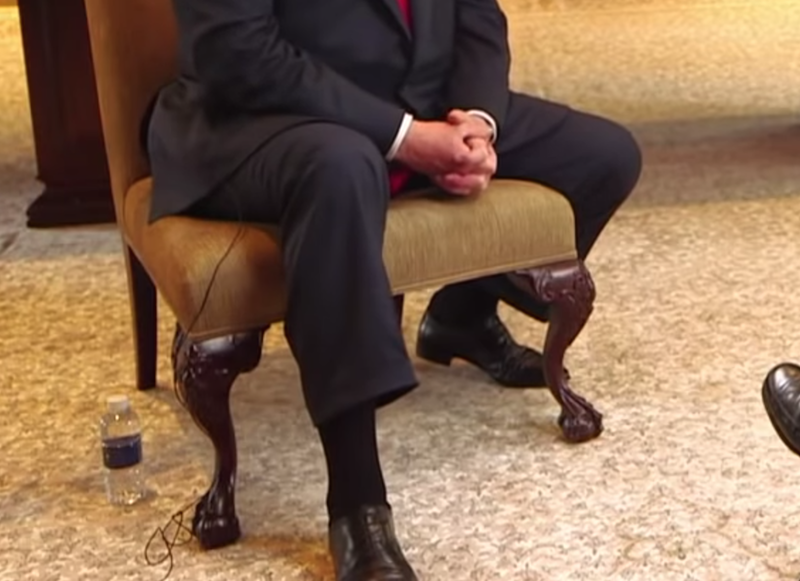 The President's hands are positioned in this manner virtually constantly during any seated one-on-one interviews. The low steeple is a hyper-alpha nonverbal. And like all alpha (or hyper-alpha) body language, a little bit goes a long way. It's a bit like garlic. You may like garlic. Garlic may be the ingredient you want. You may think Garlic tastes good in spaghetti sauce - but grandma always taught you not to use too much. Donald Trump dramatically overuses this signal. Waaaay too much garlic. Although Trump is an alpha male, it's quite unusual-to-rare to find alpha males sitting in this fashion for an extended duration. But Trump does it constantly. No other US President ever did. Ever. I defy anyone to find a single picture of another sitting US president displaying a low steeple. 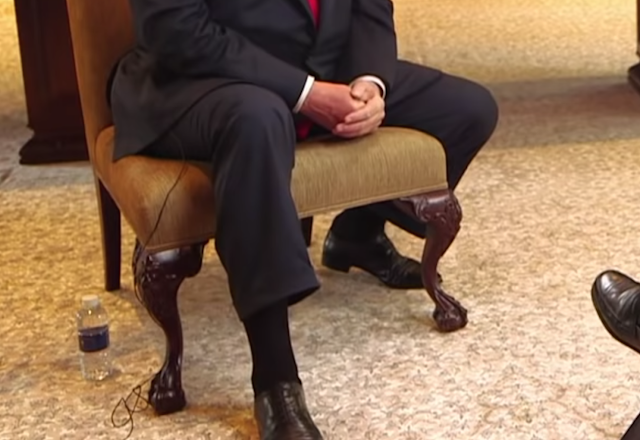 However, look at President Trump's feet. 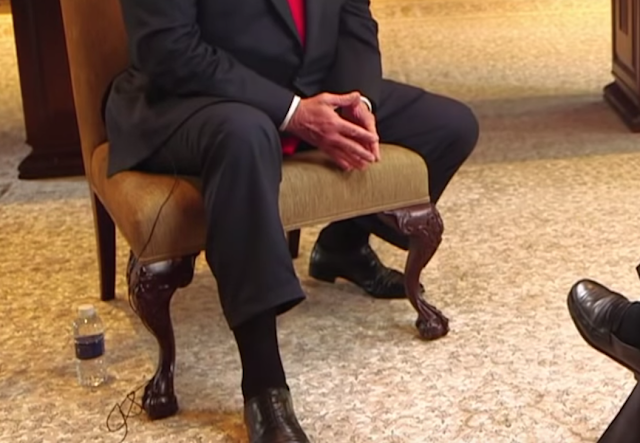 His left leg is wrapped way around the side of his chair - such that his knee is pointed to the left of Mr. Stephanopoulos. It's so far back, that his heel is positioned a bit further posterior than his gluteus. Moreover, his left heel is elevated off the floor. Trump doesn't want to be there (and it's got nothing to do with Stephanopoulos). I've analyzed Trump's nonverbal behavior well over 1000 times (over 350 published) - and although he routinely sits in the Seated Crotch Display (aka Manspreading), he never displays this leg posture of "wanting to leave" body language. Never. This nonverbal dynamic indicates President Trump is anxious. He wants to leave. He doesn't want to be in that room. If a person to whom you're speaking ever adopts this same leg-out-to-the-side posture - you can be sure they have an urgency to depart too. And although we can't see the full layout of this room - it's highly probable that Trump's left knee and foot are pointing toward an exit. President Trump also displays this hand configuration - with his fingers intertwined and tightened. This nonverbal sign is indicative of frustration - along with a component of anger. Again, this configuration is rare for Trump to use during any one-on-one interviews. This last example, that of Hand Cupping-Clenching - also projects frustration - but additionally, it carries with it a significantly more beta emotional tone. Note the President is protecting his right hand - his dominant hand. SUMMARY: President Trump displays multiple examples of anxiety during this interview - as well as frustration - along with beta emotional tone. Intriguingly, Trump's lower extremity nonverbal display is body language which he's never before used publicly during his entire campaign or thus far in his presidency. There were, in fact, three participants in this interview, Donald Trump, George Stephanopoulos - and the Room itself. The Room, of course, is a metaphor - a symbol of Kim Jong-un, the events of the Summit, and/or the agreements (or lack thereof) within the "Joint Statement".